When it comes to summer getaways, space enthusiasts with themeans have a plethora of choices, and the rise of commercial spaceflight ismaking the list even longer. From a simple trip to viewa rocket launch, to an actual flight in space, there are options to suitall kinds ? and all budgets. And while many new space experiences come with ahefty price tag, there are still some options for the budget traveler. ? At the low end of the space tourism vacation plan are simpletrips to NASA space centers or rocket launching sites at spaceports around thecountry, which come at the cost of plane tickets, a hotel stay and a rentalcar. The two final space shuttle launches, set for Nov. 1, 2010and Feb. 26, 2011, can be viewed from NASA's Kennedy Space Center in CapeCanaveral, Fla., which is home to a visitor's center that offers regular toursof the spaceport and programs on U.S. spaceflight history. ?Tourists in Houston can also see how astronauts train atJohnson Space Center. These centers also feature museums showcasing spacememorabilia and actual rockets that have made the trip to space. Kids and adults can both get a taste of the spaceflight experienceat Space Camp, at the U.S. Space and Rocket Center in Huntsville, Ala. This programoffers the chance to ride space simulators and practice a mock space mission,complete with "anomalies" thrown at participants to test their copingskills. To get a step closer to flying in space, try a weightlessflight on a modified jet - though you will to dig a bit deeper into yourpocketbook. The Zero Gravity Corporation offers weightless experiencesaboard an airplane flying parabolic curves, though these flights typically gofor about $4,950 a person. The service commercializes a type of flight used byNASA on its famed "vomit comet" aircraft to train astronauts forflying in space. 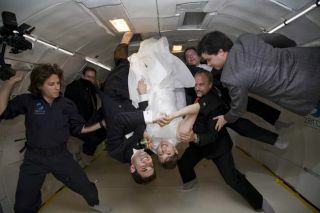 Parts of the film Apollo 13 were shot during a similar ride,and at least one couple even threw a weightless ?wedding aboard a ZERO-Gflight. These trips can be brokered through Vienna, Va.-based space tourismfirm Space Adventures. Train like a pro at the National Aerospace Training andResearch (NASTAR) Center outside Philadelphia. This facility offers immersivespace training, including centrifuge simulators that make you feel the additionalG's of launch. Virgin Galactic founder Sir Richard Branson is amongNASTAR's professional clients. For $5,800, trainees can go through a rigoroustwo-day space training program aimed at preparing future space tourists for flightson his firm's SpaceShipTwo suborbital spacecraft. The next step for any aspiring astronaut is to take a suborbitaljoyride with one of the few private firms planning to offer quick flights toouter space. These trips would fly above 62 miles (100 km) in altitude ?where space begins ? but would stop shy of entering Earth orbit. Passengerswill experience up to five minutes of continuous weightlessness and get thechance to gaze out at 360-degree views of space and the Earth's horizon below. Prices start at $102,000 for a ride on Mesquite, Texas-basedArmadillo Aerospace's suborbital rocket ships currently in development. Thosetrips can also be booked through Space Adventures. Competing firm Virgin Galactic is also planning to offersuborbital trips on its SpaceShipTwo craft, which would be carried into spaceby the company's WhiteKnightTwo mothership. These trips would lift off fromSpaceport America in New Mexico. The price for those flights starts at$200,000. Suborbital flights may seem downright affordable when comparedto a multimillion-dollar ticket to actual Earth orbit. Spacetourists can book seats on Russia's Soyuz spacecraft (when available) andfly alongside professional astronauts to the International Space Station. Theseorbital tourist trips are brokered with the Russian Federal Space Agencythrough Space Adventures in Virginia. Recent flights have gone for about $35 million, thoughprices are expected to rise to about $50 million for future seats. Soyuz slotswill become scarce after the space shuttles retire next year, when the Russianspacecraft are the only option to transport astronauts to the space station. Space Adventures has also offered a $15 million upgrade ?which would allow a customer to take a spacewalk in a Russian spacesuit ? inthe past. The company already has a waiting list for orbital trips,though especially eager recruits can get preferential access to available seatsby paying $5 million to join Space Adventures' Orbital Mission ExplorersCircle. Really intrepid space explorers ? with uber-deep pockets - canbecome the first private citizens to visitthe moon. For $100 million, avid space tourists can book a seat aboarda dedicated Soyuz flight that would take them to orbit around the moon,offering up-close views of the lunar surface. This voyage, also availablethrough Space Adventures, would allow for two paying passengers and oneprofessional astronaut steering the ship. No one has yet flown a private lunar flight, but the optionis on offer.